A good friend of mine and great creationist, Dr. Joseph Mastropaolo, has a way with words that is second to none. Below are a couple of excerpts from some of Dr. Mastropaolo’s prose that I hope you will enjoy half as much as I did. 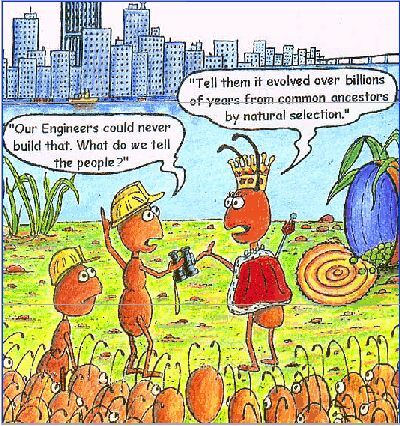 As ants cannot comprehend the civil engineering of New York City , so human intelligence aggregated cannot comprehend the mega macro and nano biological engineering of the biosphere. To attach the origin and diversity of life to the universe's brainless phantom, evolution, is the ultimate intellectual insult. That the public schools and universities of the United States of America should be engaged in such a travesty, not only violates the First Amendment of the Constitution of the United States of America, but it degrades the realistic thinking ability of science students to below no science education whatsoever. Teaching the exact opposite of reality, like a photographic negative, promotes psychosis, not education. The monarch butterfly is a good illustration of biology because all observations can be verified. Its whole life cycle is from one allotment of deoxyribonucleic acid (DNA) and can be observed in 60 days. The monarch butterfly egg is an oval about one millimeter long that hatches in three days to a caterpillar which spins a chrysalis around itself then hatches as the butterfly. Now it has the ability to fly twenty-four miles an hour while navigating a three-thousand-mile migration with all the navigational equipment on board in the size of the head of a pin. Shortly after completion of their reproductive functions, both male and female become dehydrated and die. The life cycle of the monarch butterfly teaches that in the seemingly inert egg are all of the genetic instructions to form a sixteen-legged caterpillar and a six-legged butterfly. There was no physical manifestation of the caterpillar when it was an egg just as there was no physical manifestation of the butterfly when it was a caterpillar. There was a manifested morphology while there were unmanifested in the organism’s genetic reserves meticulously planned transitional structures and different morphologies. To observe such remarkable transformations in 60 days teaches an important lesson on genetic reserves. These incredibly complex transformations, which no human engineer can blueprint, may be called sequential genetic reserves. They occur once in a rigorous order to attain adulthood and do not occur again. Every complex organism has them. Some do not transform from sixteen legs to six legs, some do not transform from pedestrians to flyers, but the transformations to adulthood are no less remarkable. Every multicelled life form must grow and develop from an egg or seed to an adult configuration and that requires continuous structural and functional alterations that are molecularly planned, organized, coordinated, controlled, and commanded beyond human comprehension. We do not know how the DNA did it, but we do know that such megengineering could not have been done brainlessly the way evolution pretends. Ants have a better chance of understanding the engineering of New York City than humans have of understanding the meg-engineering of the biosphere. The queen ant uses evolutionist brass and bluff.